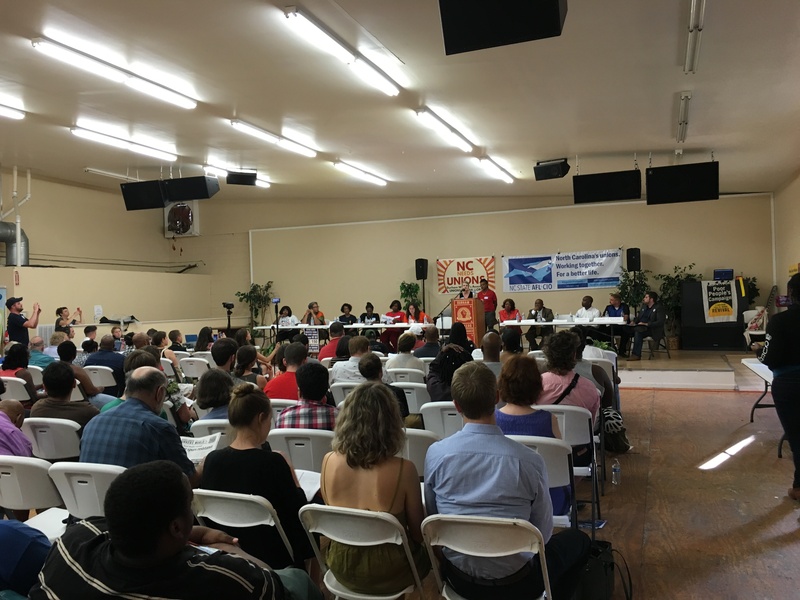 On Thursday, June 14, 2018, workers, community organizers, current union members and candidates for state and federal office met together in Durham to discuss the need to make it easier for workers to join together in strong unions. 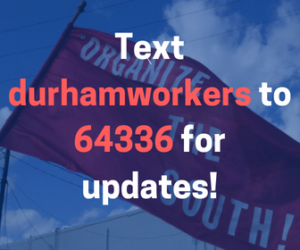 Durham, a southern city that has recently gained recognition as a “union town,” has a progressive city council and is home to thousands of fast-food, academic, domestic, public sector, federal, skilled trades, and other workers from all walks of life who stand to benefit from making it easier for workers join together in unions in North Carolina. Doing so would allow working people the freedom to collectively stand up for their rights, increase the safety and health standards of their workplace, and negotiate better benefits and wages that reflect and increase employee fairness and dignity. North Carolina, a “right-to-work” state, has traditionally faced many barriers to forming unions. Not only are there legislative obstacles undermining unionization, but many companies also spend billions (cough, Duke University, cough) on fear campaigns that threaten workers in order to fight unionization efforts, suppress worker organizing, and keep wages low. But at the town hall, workers rose up chanting, “It’s union time,” effectively warning corporate lobbyists of what they already know: that they can’t play this game forever. The event was co-organized by the Durham Workers Assembly and about 15 other organizations and groups including the NC State AFL-CIO, the National Domestic Workers Alliance, the Farm Labor Organizing Committee, and the Fight for $15. It seems to me, it’s not a matter of can North Carolinians take back the power and effectively stand up to big money, but when. The need is clear and the movement is right here in our state. Will Durham lead the way? The presence and energy at last night’s event is a testament to the enormous amount of people-power in North Carolina. We will certainly be watching to see if the candidates and officials make their promises a reality, and keep their word to support legislation that will help make it easier for workers to join together in unions. As testified by numerous workers and organizers who shared their stories, removing barriers to worker organizing is one of the most effective means of addressing America’s growing inequality, and higher unionization rates, especially in the south, could mean an increase in the standard of living for millions of Americans currently struggling to survive on poverty wages. This article originally posted by United for a Fair Economy.